Feng Teng, our modern-day Prince Charming, replaces his white stallion with a bike. Feng Teng sorta confesses to Shan Shan?! Okay, not really but it was still all kinds of adorable. But anyways, Shan Shan is not allowing herself to believe that he likes her just yet. Believe it, girl, because it’s real. Just believe. This Shan-Teng love story is seriously too cute, so please don’t go breaking our hearts later on. Shan Shan is sitting at home staring at the skincare products and thinking about the person who gave them to her, Mr. Feng Teng. After a long deliberation with herself, she comes to the conclusion that she must have been really stupid to think that Feng Teng liked her just because he gave her skincare products. Shan Shan, you’d be crazy to think that he doesn’t like you! In the midst of daydreaming about having a boyfriend in the future, her mind suddenly wanders to Feng Teng. Hmm…not the first time that’s happened. At work the next day, one of Feng Teng’s secretaries, May, gives Shan Shan a flyer for the upcoming annual company-sponsored excursion. Field trip! The trip was originally scheduled for the HR and Production Departments, but Feng Teng randomly decided that he’d rather go with the Finance Dept. instead. I wonder why. Shan Shan immediately thinks that if she goes on this trip, she’s going to have to spend the entire time listening to Feng Teng boss her around. Shan Shan makes up the excuse that since she hasn’t been an employee at Windgroup for a full year yet, she has to cover her own expenses for the trip and she just doesn’t have the extra money right now. May reassures her that Feng Teng already paid for all her expenses, leaving Shan Shan speechless. He’s ballin’, remember? During lunch, Shan Shan averts her eyes from Feng Teng and sheepishly tells him that she doesn’t want to go the excursion. Feng Teng doesn’t buy it, and suggests that she must want to stay behind to take practice tests for her CPA test. Hearing that, Shan Shan quickly changes her mind and says that she absolutely can’t wait to go on the trip. On the morning of the excursion, Shan Shan purposely plans it so that she’ll show up an hour later than the scheduled departure time, thinking that there’s no way that the entire group would wait for just her. Problem solved! After taking her sweet time getting to Windgroup, Shan Shan sees that there’s no one waiting for her and thinks that her plan must have worked. She puts on a little show for the security guard outside the building, acting like she’s super disappointed that the bus left without her. While she’s yelling at the Shanghai public transportation and the universe for making her late and missing the trip, May runs up to her. She tells Shan Shan that everyone’s been waiting for her to show up. When she’s reluctantly dragged onto the bus by May, the only available seat remaining is next to Feng Teng, of course. Shan Shan asks him why they were still here if the departure time was at 7 AM and not 8. He very coolly asks if she knew the departure time was at 7, then why did get there an hour late. Busted. May tells her that Feng Teng had changed the departure time at the last minute, saying that 7 was too early, but no one told Shan Shan. Very sly, Feng Teng, knowing that Shan Shan would try to pull a trick like this. Feng Yue and Li Shu meet up with the group at their destination, Li Shu immediately starts giving Shan Shan the stink-eye and says that she doesn’t get why Feng Yue said that she was a special girl. To her, Shan Shan seems pretty ordinary. Feng Yue tells her that the fact that Feng Teng likes her makes Shan Shan special. In yo face, Li Shu. She keeps watching them as Shan Shan and Feng Teng are walking together, and Shan Shan insists on carrying his backpack for him. Later when Feng Yue and Shan Shan are having a chat by themselves, Feng Yue tells her that she’s surprised that her brother let her carry his backpack because he typically hates when people touch his things. Shan Shan freaks out when she hears this because she’s the one who forced him to give it to her. Feng Yue laughs at how scared Shan Shan is, and asks if Feng Teng is really that scary and if he hasn’t been nicer to her lately. She then lays down some friendly advice for Shan Shan that every woman should find someone who truly loves her. Ya know what I’m saying, Shan Shan? Wink wink. 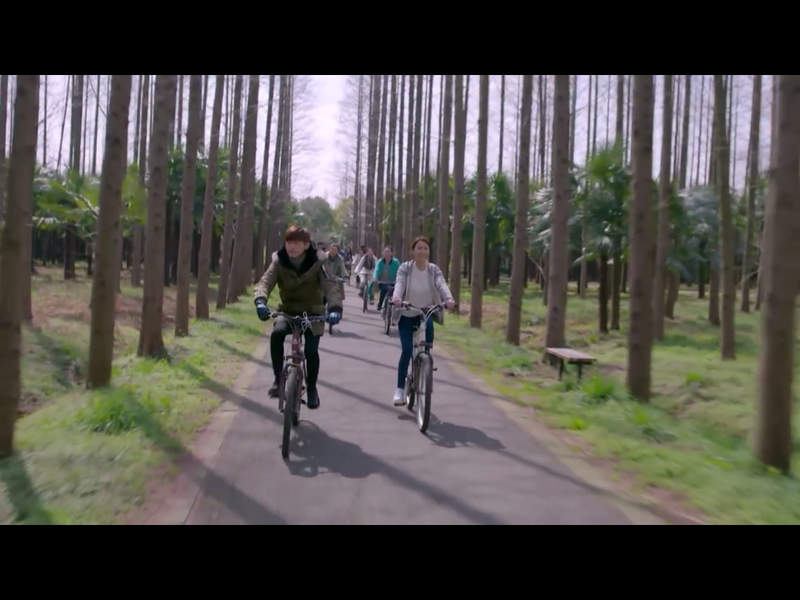 The entire group goes on a bike ride around the park they’re hanging out at, and Feng Teng and Li Shu start racing with each other and ride away from everyone else. Shan Shan tries to catch up to them, but they’re speeding away from her. When she gets to a fork in the bike path, she decides to take the smaller path, not knowing that Feng Teng and Li Shu biked down the other one. As she’s riding on her own, her bike steers off course, causing Shan Shan to fall and to sprain her ankle. 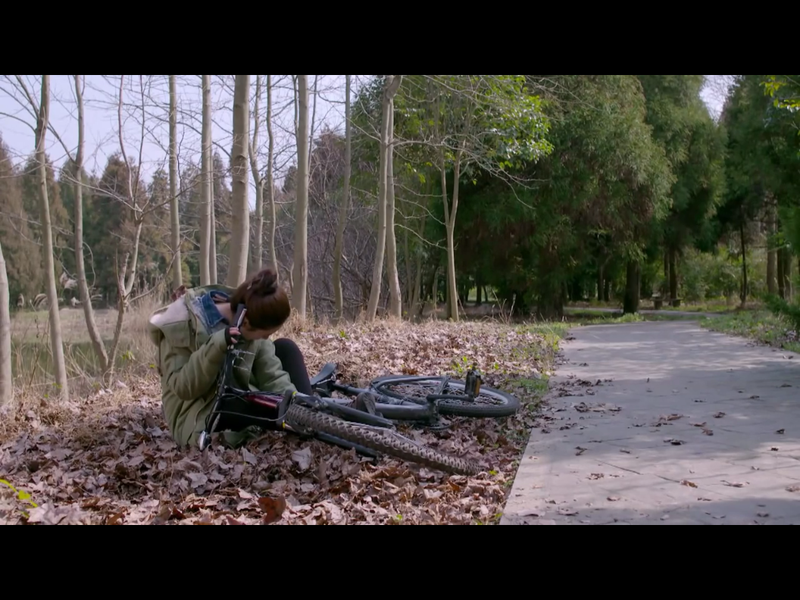 Trapped under her bike and unable to move, Shan Shan reaches for her phone to call for help but realizes that it’s gone. When the rest of the group finished biking around the park, they realize that Shan Shan isn’t with them and no one has seen her for awhile. Feng Teng gets really worried and rides off by himself to find her, and everyone else splits off into groups for the Shan Shan search party. 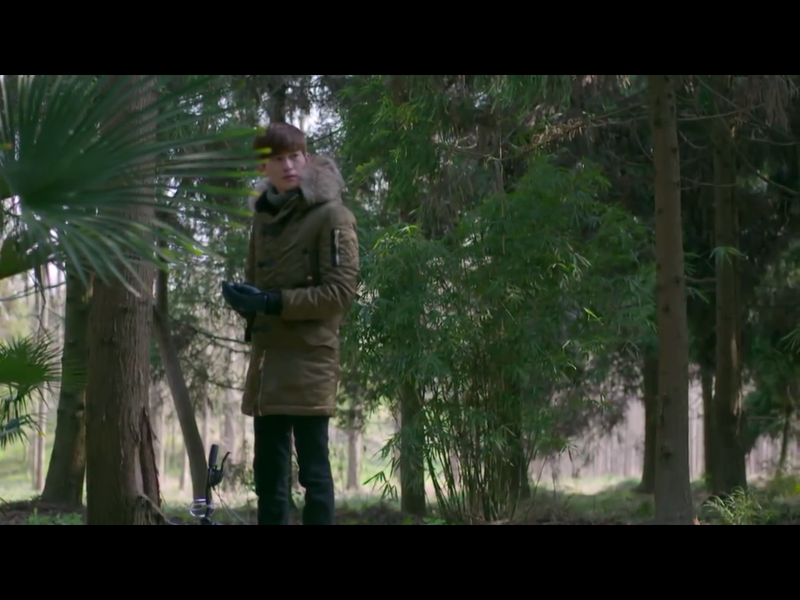 As he’s biking around and calling out Shan Shan’s name, Feng Teng comes across her lost phone and realizes that she must be stranded somewhere. He finally finds her on the side of the road, crying and hurt. Feng Teng to the rescue! Shan Shan tells Feng Teng that she sprained her ankle really badly and can’t walk. Feng Teng picks her up and carries her on his back. Shan Shan asks him to put her down because she must be too heavy for him to carry such a long distance, but he just ignores her. During their walk back to the group, Feng Teng tells Shan Shan that he won’t let himself make the same mistake again. And when Shan Shan asks him what he’s talking about, he says that he won’t ever let her be sad by herself ever again. *SWOON* x INFINITY. Shan Shan is taken aback by what he just said, and thinks that it doesn’t sound like the type of thing that a boss would say to an employee, but more like what the prince tells the princess in a fairytale. Omg yes, because he’s your Prince Charming! After hearing from the doctor that Shan Shan only has a sprained ankle and will get better in a couple of days, Feng Teng still tries to postpone his trip to Korea with Zheng Qi to discuss the acquisition of the company, KM. Zheng Qi convinces him to go to Korea because there’s an American company that’s showing interest in KM as well, so they can’t afford to postpone the trip. Li Shu volunteers to care for Shan Shan while Feng Teng is away because she feels bad that her injury was partially her fault. In the meantime, Feng Teng also hires a caretaker to help Shan Shan. Li Shu takes it upon herself to stick around Shan Shan’s place all the time, in the name of taking care of her. In reality, she’s there to drop hints about how Feng Teng is hers. She apologizes to Shan Shan for causing her injury, and says that she feels really bad about it because Feng Teng’s business is also her business. UGH. Save it. Liu Liu and Shan Shan’s roommate see right through Li Shu’s fakeness, and tells Shan Shan that she’s trying to show off her relationship with Feng Teng. Shan Shan keeps thinking of ways to get out of her mandatory sick leave from work that Feng Teng placed her on, especially because it’s an especially hectic time in the Finance Dept. She sends Feng Teng selfies of herself holding up drugstore medications for her ankle, saying that she can just use these for her injury instead of the cast they put on her. Feng Teng refuses to let her go back to work, and instead says that if she doesn’t stay home for a week to get better, then he’s going to take away her end-of-year bonus. Of course, Shan Shan defies Feng Teng’s orders, since he’s in Korea right now anyways and not at Windgroup. Her first day back at work, a new employee arrives in the Finance Dept. And by the looks of it, she looks mad shady. During the company excursion, Li Shu tells Feng Teng that she thinks Shan Shan seems “pretty nice.” So much shade. Feng Teng smiles and says that he likes her exactly for that reason, her “pretty niceness.” Cuuuuute. Liu Liu and Shan Shan’s roommate come to the hospital when they find out that she’s hurt. When they get there, Liu Liu immediately starts yelling at Feng Teng for allowing Shan Shan to get injured on a company-sponsored trip. Instead of getting angry, Feng Teng apologizes and accepts full responsibility for Shan Shan’s injury. After getting to know each other better, Shan Shan asks Li Shu if Feng Teng’s her boyfriend. She denies that they’re boyfriend-girlfriend. Shan Shan thinks that she and Li Shu are becoming good friends. No! Shan Shan, she’s out to steal your man! I’ve liked Feng Yue right from the start. I’m glad she’s such a Shan Shan supporter. At first, I didn’t really like how cold and abrupt Feng Teng’s personality was. I’m happy he’s warming up a little.